The year 2008 was a tough one for most public corporations. The stock market collapsed, diving 38 percent. The broader economy sank into the deepest and longest recession since the Great Depression. The financial markets froze, blocking companies from their usual ability to borrow when in trouble. Even against this depressing backdrop, some companies' suffering stood out. American International Group (AIG) endured cataclysmic losses in 2008, over $13 billion in just the first six months. Annual losses grew to a staggering $99 billion by year's end. From a high of over $70.00 per share, AIG's stock price fell to $1.25 per share in September, a drop of over 98 percent. To keep AIG afloat, the federal government ultimately loaned the company over $180 billion. Few companies have imploded as dramatically as AIG. But other companies' shares also dropped much further than the market as a whole. The stock price of Abercrombie and Fitch sank 71 percent, for example, and the oil and gas company Nabors Industries saw its share price cut in half. When a company performs as dismally as these three did, we expect the board to fire the CEO. We might also envision (even a little gleefully) that the CEO's assets would be confiscated in lawsuits by angry shareholders. Images of brave captains going down with their ships spring to mind. After all, these CEOs led their companies into disaster, causing mayhem for employees, customers, suppliers, the economy generally, and, most important, the companies' owners-the shareholders. In a Darwinian economy, we expect the weak to be, well, eaten. AIG's CEO, Martin Sullivan, was, in fact, fired. Then AIG's board of directors paid him $47 million severance as a reward for a job well done. Abercrombie's CEO, Michael Jeffries, not only kept his job, but received $71.8 million in total pay, roughly equivalent to $1 million for each percentage point decline in the company's value. The total included a $6 million retention bonus to persuade Mr. Jeffries to stay, even though he had been with the company for seventeen years and showed no signs of leaving. Nabors's CEO, Eugene Isenberg, also made out pretty well, taking home $79.3 million, including a $58.7 million bonus. These sorts of stories of CEOs receiving enormous rewards for dismal corporate results anger almost everyone, from pundits to presidents. They seem like clear signals that something is wrong with the way the corporations are governed. You'd be hard-pressed to find someone who thinks these CEOs deserved the pay they got. When a company does poorly, even defenders of the current system tend to agree that it's wrong for the CEO to take home a huge paycheck. GE compensated Welch richly for his leadership. To give some sense of the wealth Welch-who comes from a humble background-accumulated during a lifetime of employment at GE, the year of his retirement Forbes estimated his net worth as $680 million (equivalent to almost $900 million in 2012 dollars). Is there anything wrong with Welch earning huge sums for expanding GE's worth nearly thirtyfold? Many people believe that when a corporation does poorly, its leader should suffer commensurately. That CEOs such as Sullivan, Jeffries, and Isenberg receive eight-figure compensation packages understandably offends shareholders who are suffering staggering losses. Employees losing their jobs at these companies no doubt feel similarly outraged. Conversely, many would support the notion of rewarding excellent performance like Welch's with superior pay. Is it possible that both these ideas are wrong? Is blaming the CEO for a corporate meltdown unfair? And is rewarding the CEO for a company's outstanding performance wrongheaded? Could basic ideas like (1) the CEO determines the company's performance and (2) tying the CEO's pay to the company's performance will motivate the CEO to excel be completely off-target? Our notions about pay and performance and the link between the two are based on a number of deeply held ideas that are difficult to question. What ideas am I talking about? The least controversial of these is our sense of what's normal. For the past few decades, CEO pay has risen dramatically, even after accounting for inflation. There have been a few off years, but we are typically treated to a steady diet of news stories about the latest enormous increase in CEO compensation. Because this trend has continued for so long, we tend to think that this is how things have to be. We also have a strong intuition about how CEO pay should be structured. We are used to hearing about million-dollar salaries that are dwarfed by large bonuses, huge baskets of restricted stock, and enormous options packages (sometimes in the tens of millions). The key, we believe, is to tie CEO pay to the company's performance so the CEO will be incentivized to run the company well and boost the stock price. Like our beliefs about having consistent increases in the amount of pay, the conventional wisdom about the structure of CEO pay has lasted for several decades, long enough that most of us have trouble conceiving of any other method than tying pay to performance. Many of us also think of corporations in a sense as people. The comparison of a corporation to a person can seem apt in important ways; corporations are entities with interests and motives of their own that act aggressively to increase their wealth and power. Some of us may be suspicious of corporations; we may fear that they have far too much power in our society, that they have the money, sophistication, and connections to get what they want from the political system in a way most of us cannot. But I suspect few of us worry that corporations are vulnerable, that they are too easily taken advantage of in some of their most important deals. To most of us, corporations-especially the type of large, publicly traded corporation I discuss in this book-are the epitome of power. We might need protection from them, but they are perfectly capable of looking out for their own interests. Our faith in corporations seems especially well placed when they are negotiating their CEOs' payment packages. What could be a more important decision than how a company motivates its leader? Surely with so much at stake, and with so much sophistication and intelligence applied to the task, corporations and their CEOs must negotiate the most effective and efficient compensation packages possible, designed to inspire just the right actions. The market for CEOs (including their pay packages) must be incredibly efficient. There is a split in popular thinking at this point. While many people wholeheartedly agree that CEO pay is set efficiently, others feel that the directors who run corporations do not bargain at arm's length with their CEOs. These critics suspect some version of crony capitalism must be at work. The directors and the CEOs move in the same social circles; many directors actually are CEOs or senior executives at other companies. Whether out of affinity for one of their own or outright corruption, the directors may funnel as much corporate wealth as they can to their friend the CEO. There is little overlap between those who think CEO pay is efficient and those who believe it is the product of cronyism or corruption. Most people will agree with one of these ideas and disagree violently with the other. It's hard to imagine a sane person simultaneously believing that CEO pay is highly efficient and corrupt. Whichever theory you believe, though, you likely believe quite strongly, to the point that you have trouble entertaining seriously the possibility that the other might be true. If you're in the efficiency camp, you will almost certainly agree with two additional statements: (1) it is imperative that companies hire the very best CEOs they can find, because the right leader can make all the difference to a company's performance; and (2) boards of directors are well equipped to figure out who that right person is. For the CEO labor market to be efficient, both statements must be true. If it doesn't matter who runs the company, then there is not much incentive for it to work out the best possible pay package. And if directors can't choose the best CEO from a pool of candidates, then we can't have much faith that there's a market in which buyers bid for the best CEO talent; you have to be able to recognize talent before you can bargain for it. Most folks in the cronyism/corruption camp will also agree that leadership is important, though perhaps they will feel less sanguine about directors' ability to spot talent. With that brief detour into dissension, I think we can safely return to unanimity with the last two ideas. First, people are motivated by pay. If you're hiring a real estate broker, your broker's compensation should depend on the sale price of your house. That way, your broker will share your incentive to get as much money for the house as possible, and you're much more likely to maximize your profits. CEOs should be paid the same way. The more closely companies tie CEO pay to the company's results-the more sensitive CEO pay is to performance-the more successful the company should become. Well-managed companies will apply this principle throughout the organization, making everyone's paycheck depend on how they do their jobs. But it's especially important for the CEO. Second, the CEO works for the corporation's owners, the shareholders. Since it's the shareholders' company, it's their well-being (which you can read as "wealth") that matters. Ultimately, then, the goal of a good CEO pay package is to motivate the CEO to earn as much money as possible for the shareholders. Other groups with ties to the corporation-such as employees, bondholders, customers, and the communities in which the company operates-are important only to the extent that meeting their needs furthers the fundamental goal of maximizing shareholder wealth. If these ideas sound right to you, if you've been nodding your head, maybe thinking "of course" as you read, then it may surprise you to learn that none of these ideas has strong empirical support. In fact, the evidence weighs against most of these notions, in some cases quite strongly. One of the central purposes of this book is to unpack these supporting intuitions and reveal just how flimsy the evidence for them is. But it's not enough to show that the common understanding of CEO pay is wrong; I will also explain how CEO pay really works. The defense that CEO pay is efficient and the critique that it is the product of corruption have something in common: both assume that boards are acting purposefully and achieving their aims, whether those aims are to motivate the CEO or to line the CEO's pockets. But the evidence suggests that something quite different-something much less calculating and much more human-is likely going on in corporate boardrooms. I call this explanation the "behavioral theory" because it is based on empirical studies of how people actually act (behavioral economics rather than the rational actor theory). To understand the dynamics of CEO pay in public companies, we need to start with a preview of the history (chapter 2). The experience in recent decades of rising CEO compensation and increasing use of equity as performance pay is a radical departure from prior decades' practice. For the first few decades after World War II, CEO pay at the largest U.S. public companies remained flat in real terms (controlling for inflation) and consisted mostly of salaries and short-term bonuses. Companies used very little equity in pay packages. Some companies began to include stock options in CEO pay packages during the 1950s, but the majority did not until the 1970s. And even when companies did award options, they didn't amount to much; salary and bonus accounted for 93 percent of total CEO compensation during the 1950s and 87 percent of the total during the 1960s. (The rest consisted of stock options, restricted stock, and other long-term incentive plans.) The current norm of rapidly rising pay and heavy use of performance pay began only in the late 1970s and didn't really take hold until the 1980s. This major shift provides an opportunity to probe the inner workings of CEO pay. What caused these two radical changes in the amount and structure of CEO pay? As I explain in later chapters, neither the efficiency nor the cronyism/corruption theory can explain these changes satisfactorily. But my behavioral theory can. The behavioral theory suggests that the switch to performance pay was the product of emerging economic ideas about how employees should be motivated (known to economists as agency cost theory). Beginning in the mid-1970s, economists (most prominently Michael C. Jensen and William H. Meckling)argued that people who worked for corporations-even as the companies' chief executive officer-would not automatically act in the companies' best interests. Instead, they would, as all good economic agents do, pursue their own well-being to the extent they could get away with it. To get the most out of their employees, companies had to harness their workers' self-interest by tying pay to their performance. As Cornell Law School's Lynn Stout and University of Southern California economist Kevin Murphy have separately recognized, boards were influenced by academic theories about the optimal structure of CEO pay. Increasing numbers of companies began to comply with academics' advice, relying more heavily on forms of pay that tied CEOs' remuneration to the companies' stock price-especially through stock options. As more and more companies adopted performance pay, the notion that performance pay was key to good corporate governance amassed greater credibility. Eventually, the extent to which the CEO's pay was sensitive to corporate performance became the central metric by which shareholders judged whether the company had structured the pay package appropriately. Just as companies were adding stock options to the CEO pay mix, along came the longest bull market in U.S. history, making those options incredibly valuable. In August 1982, the Dow Jones Industrials Index stood at 777. Over the next eighteen years, the Index rose a jaw-dropping 1,500 percent to reach 11,722 in January 2000. There were some bumps along the way-most notably on October 19, 1987 ("Black Monday"), when the Index suffered a 508-point collapse-but for the most part, the market's rise was not only astronomical but also remarkably stable. The combination of heaps of stock options and other equity incentives and this historic bull market raised CEO pay to previously unimagined heights. Nevertheless, despite the fact that the rising stock market was making options far more lucrative than boards likely anticipated when they issued them, directors couldn't seem to break themselves of the habit of giving options to CEOs. To the contrary, they kept issuing more, catapulting CEO pay into the stratosphere. Why? Why would some of our smartest and most sophisticated businesspeople, entrusted with managing our largest and most important companies, continue to offer stock options when they were clearly leading to unprecedented growth in CEO pay? It's hard to imagine those same directors would have stuck voluntarily with a pricing structure for any other important input when that structure resulted in dramatically higher prices without apparent justification. Suppose, for example, that a company that sold oil agreed to pay its sales force on commission, a percentage of the gross sales each salesperson brought in. If the price of oil suddenly skyrocketed, so that a salesperson could earn five times as much for selling the same volume of oil, would we expect the company to keep the same compensation strategy? Of course not. The oil company would reduce the commission percentage or switch to a fixed compensation amount per volume of oil sold. And if the salespeople didn't like it, the company would replace them. Corporate CEOs may be more difficult to replace than salespeople. And boards might have been reluctant to drive off a successful CEO by suddenly cutting off the supply of profitable stock options. But we should still have seen boards make some attempt to pare back, to switch to less explosive forms of pay. Instead, boards doubled down, relying more and more heavily on equity-based compensation. At their peak in 2000, stock option awards made up about half of CEOs' total pay. My behavioral theory argues that directors' failure to rein in CEO pay was not due to some market force that suddenly made a different form of pay-and much higher pay-the compensation system best calculated to improve shareholders' welfare, nor were directors seduced by CEOs' promises of corporate largesse. Directors stayed with equity-based pay because they believed that was the best way to motivate their chief executive officers to focus on boosting the stock price. This seems a perfectly appropriate motivation. Under the dominant theory of corporate governance, it's exactly what directors are supposed to do-raise the stock price. (I have some doubts about the desirability of making this the paramount goal, as I discuss in chapter 9, but it is the prevailing understanding of directors' central task.) The problem with directors' strategy of using equity-based performance pay to achieve that goal is this: there is no convincing evidence that it works. There are two conditions that must prevail for equity-based pay to result in higher stock prices: equity-based pay must improve CEOs' performance, and CEOs must have the power to raise their companies' stock prices. The best evidence is that neither of these conditions holds true. Scholars have produced surprising results when testing the impact of performance pay. Most empirical studies have found little to no link between a company's use of performance pay devices such as stock options or bonuses and subsequent increases in the company's stock price (or earnings or any other measure of corporate success). Some studies have even found that corporate results degrade as boards rely increasingly on performance pay to motivate their executives. These results, though shocking, are consistent with psychological experiments in the laboratory. Psychologists have discovered that performance pay erodes intrinsic motivation for the sort of high-level cognitive tasks CEOs perform. They have also found that individual performance deteriorates on these sorts of tasks (i.e., those that require creativity or analytical reasoning) when subjects know they will be rewarded for their success, especially if the rewards are very high. Although not quite conclusive, the evidence points strongly against the utility of performance pay. As to the second condition, CEOs' ability to have a positive impact on the companies they lead is unclear. Some leaders like Berkshire Hathaway's Warren Buffett or Apple's Steve Jobs seem to have transformed their companies, but others like AIG's Martin Sullivan appear to have sunk them. Salient examples like these support people's view that leadership (whether good or bad) is important. When scholars try to validate this instinct empirically, though, they run into serious trouble. Part of the problem is that there are a slew of factors that may influence a company's success besides its leader, from the price of oil to interest rates to government regulation to fashion trends. To isolate the effect of CEOs in particular, scholars need a lot of statistical power, which in turn requires hordes of data points. But there simply aren't enough leadership shifts to generate that statistical power without including many decades of data. And going that far back in history just compounds the problem by adding even more variables that could affect the results. These difficulties have not prevented scholars from trying to design tests that will work with the data they have. Their studies have generally found that CEOs do not make much difference to corporate results on average. The paucity of data might caution us not to rely too heavily on these studies, but the fact that most of them come to the same conclusion should give us serious pause. Maybe CEOs don't typically have the kind of monumental impact on their companies that people generally assume. There is an important caveat to note here: these studies compare the impact of different people who were all sufficiently qualified to persuade a board to hire them as the CEO of a public company. No one is claiming that some random person off the street could run Apple as well as Steve Jobs did. But when we compare members of that rarified group of actual public company CEOs, it's hard to see differences among them by looking at changes in their companies' stock prices. Perhaps because these CEOs are so similar to one another in training and background, or perhaps because environmental effects constrain most CEOs to make parallel decisions, the board's decision to hire one hyper-talented candidate over another seems largely irrelevant. Performance pay is much more expensive than guaranteed compensation because boards must offer executives higher expected pay to make up for the significant chance that they will fail to meet the performance targets and receive little or nothing. Advocates of performance pay therefore bear a heavy burden to demonstrate that its enormous costs are offset by improved corporate results. The best evidence, though, indicates that this is not the case; performance pay is more likely to lower a business's profits than to raise them. What the evidence tells us, then, is that equity-based pay such as stock options is highly unlikely to result in higher stock prices, both because equity-based pay does not seem to produce better performance from executives and because executives generally have little influence over share prices. Yet directors' enthusiasm for equity pay has if anything only intensified over the past few decades. In recent years, they increasingly have been substituting restricted stock for stock options, but their fondness for equity-based performance pay remains as strong as ever. This contradiction is mind-boggling. Public company directors continue to spend literally billions of dollars on equity pay annually on the strength of an academic theory that has little empirical support. How could such smart, sophisticated businesspeople spend so much money on an unsupported theory? Perhaps at first directors relied on the credibility of the academics who were advancing these theories. But once it became clear that equity-based compensation was having a tremendous impact on the amounts companies were paying their CEOs, why didn't directors begin asking tough questions about what benefits the companies were getting in exchange for all this money? The answer begins with an epistemic problem: it is impossible to measure a CEO's contribution to the firm, even years after he or she has retired. Directors never find out whether they overpaid the CEO or got a terrific bargain. How much was Jack Welch really worth? General Electric certainly prospered during his tenure as CEO, but how much of that was due to Welch as opposed to GE's preexisting personnel, intellectual property, factories, market position, and brand reputation? How much was due to general market conditions or fortuitous circumstances? There is no way to answer that question with any confidence. Crediting Welch alone with the rise in GE's stock price seems an extreme position. Surely other factors played at least some role in helping GE grow so dramatically. But how much? We will never have a definitive answer to this question. Directors nevertheless need to find a way to determine how much they should be willing to pay a CEO. On the one hand, they don't want to pay more than the CEO will produce for the firm. Businesses that make a habit of spending more on assets than those assets produce in income don't tend to survive very long. On the other hand, they don't want to miss out on a CEO who could radically improve the company's fortunes because they balked at the cost. Imagine if Apple's directors had failed to hire Steve Jobs because of a pay dispute. Figuring out how much is too much is an intractable problem, and yet getting the answer right is very important. Although it is impossible to find the correct valuation for a CEO's services, directors persuade themselves that they have come up with a reasonable valuation. Even approximate valuations of CEOs' services are likely impossible, given the host of variables that affect a company's fortunes. But the interaction of some well-documented phenomena of human behavior creates the illusion for directors that they have hit the mark. These include the illusion of validity, the illusion of control, groupthink, and social cascades. The illusion of validity persuades directors that the information they have about CEO candidates is far more predictive of those candidates' future performance than it really is. The illusion of control encourages directors to discount the role luck has played in candidates' careers, causing directors to give the candidates too much credit for their successes. Groupthink induces overly cohesive boards to avoid dissent when hiring a CEO by reaching consensus quickly and then protecting the consensus choice. Once a leading contender has emerged, groupthink encourages boards to give short shrift to arguments against the leader and discount negative information. Social cascades act to justify the amount of compensation companies pay their CEOs as the product of the market. Social cascades can occur when participants lack sufficient private information to outweigh the apparent value of publicly available information. Together, these behavioral dynamics encourage boards to believe that their chosen candidate is far superior to the competition and therefore worth a premium price. And since other companies are paying a similar amount, the premium is not viewed as excessive. Unfortunately, measuring a CEO's future impact on the company is next to impossible, and directors' faith in their ability to divine who will be the next Steve Jobs is almost entirely misplaced. Because directors believethey can predict a CEO's future success, though, they also reasonably believe they would be breaching their duty to the shareholders if they failed to hire the best CEO the company could afford. If a board thinks it has the opportunity to hire a game changer-a Steve Jobs or a Warren Buffett-then just about any amount of pay can be justified. This is why directors failed to stop the equity pay-inspired avalanche of CEO compensation during the 1980s and 1990s. They thought it was crucial to hire the best person to head their companies, and they were confident they knew who that person was. And in terms of pay, directors' best information came from what everyone else was doing, and everyone else kept using equity pay and raising compensation. Convinced? You shouldn't be, at least not yet. Like a good trial lawyer, I have laid out my argument in my opening statement, but I still have to present the evidence. I'll do that in three parts. Part I explains why the dominant theories of efficiency and cronyism/corruption do not conform to the available evidence. It starts in chapter 2 with some background on the changes that have occurred in the form and amount of CEO pay. Chapters 3 and 4 then take on the notion that CEO pay is efficient. Chapter 3 explains that the underlying premise of market efficiency-that there are sophisticated buyers and sellers bargaining at arm's length-is highly suspect in the public corporation context. Chapter 4 takes on the different efficiency arguments directly, one at a time, and demonstrates their theoretical and empirical weaknesses. Finally, chapter 5 sets out the dominant critique of CEO pay-that directors are allied with CEOs in attempting to raise CEOs' pay-and uncovers its flaws. Part II explains my behavioral theory of CEO pay. I begin in chapter 6 by looking behind the nearly universal consensus that CEOs' pay should be tied to their performance to motivate them to act in the shareholders' interests. There I show that the empirical evidence-both from laboratory experiments and from empirical studies of companies' use of different payment structures-demonstrates that equity-based performance pay has failed in its purpose of producing better corporate performance. Chapter 7 explores the evidence that CEOs matter to corporate fortunes. It argues that CEOs do not matter very much on average, at least as compared to other CEOs with comparable training, experience, and ability. Chapter 8 rounds out this part by explaining why directors have clung to performance pay even when it produced dramatic increases in compensation without comparably dramatic improvements in corporate performance. Part III presents my thoughts about reform. Chapter 9 questions whether the stated goal of CEO pay embraced almost universally by both sides of this debate-to align CEOs' incentives with those of the corporations' owners, the shareholders-is the best policy if our aim is to maximize social welfare. I conclude that there is insufficient evidence to come to a definitive answer to this question and recommend encouraging directors to experiment transparently with different priority weightings. Chapter 10 critiques some common reform proposals and contends that we should be much more modest in our aspirations for CEO pay. Pay is unlikely to act as an automatic motivator for CEOs. We should end our decades-long experiment with incentive pay and explore other methods of inspiring our corporate leaders, such as harnessing reputational desires, creating motivational cultures, and cultivating internal drives. I also recognize, though, that there are serious barriers that will make it very difficult to abolish performance pay. We should work to eliminate those barriers, but while they stand, directors can still improve the way they use performance pay. Directors should design a bonus structure that ties CEOs' payments to factors that are (a) largely within officers' control, (b) hard to manipulate, (c) easy to measure, and (d) important to the corporation's long-term goals. When applying these bonus triggers, boards should set thresholds that are reasonably attainable, and then the bonuses should increase as performance improves. Also, no single bonus component should be too large in either absolute or relative terms. I provide a case study to demonstrate how this would help us provide less distortionary incentives to executives while curbing the growth in CEO pay. We can and should have not only better motivated but also cheaper chief executive officers. Prodded by economists in the 1970s, corporate directors began adding stock options and bonuses to the already-generous salaries of CEOs with hopes of boosting their companies’ fortunes. Guided by largely unproven assumptions, this trend continues today. So what are companies getting in return for all the extra money? Not much, according to the empirical data. 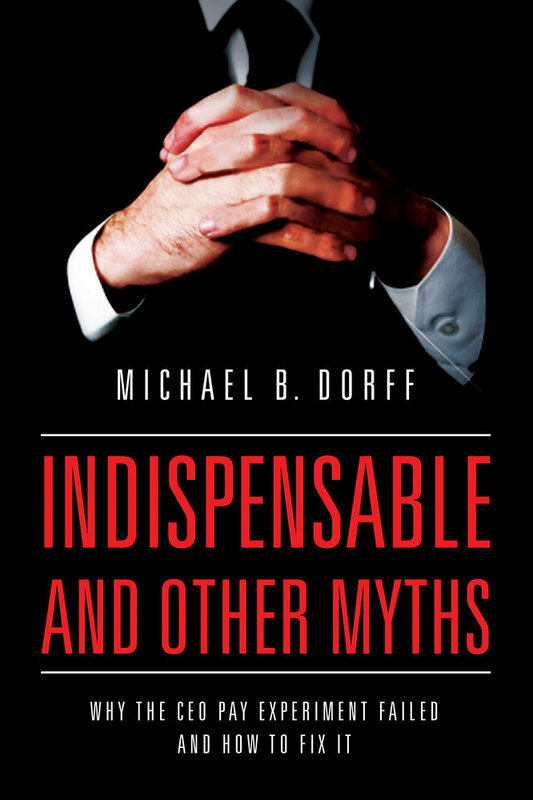 In Indispensable and Other Myths: Why the CEO Pay Experiment Failed and How to Fix It, Michael Dorff explores the consequences of this development. He shows how performance pay has not demonstrably improved corporate performance and offers studies showing that performance pay cannot improve performance on the kind of tasks companies ask of their CEOs. Moreover, CEOs of large established companies do not typically have much impact on their companies’ results. In this eye-opening exposé, Dorff argues that companies should give up on the decades-long experiment to mold compensation into a corporate governance tool and maps out a rationale for returning to the era of guaranteed salaries. Michael Dorff has taught at UCLA School of Law, Rutgers Law School, and the Peter F. Drucker and Masatoshi Ito Graduate School of Management. He is currently Professor of Law at Southwestern Law School, where he teaches corporate law and other business law topics. "Disruptive thinking based on solid research. This book will change your conclusions about CEO compensation structures based on the Pay for Performance mantra. "—Carl Albert, Chairman, Boise Inc.
PART I. WHAT’S WRONG WITH THE DOMINANT THEORIES? PART II. WHAT’S REALLY GOING ON? PART III. HOW CAN WE BEST REFORM THE SYSTEM?